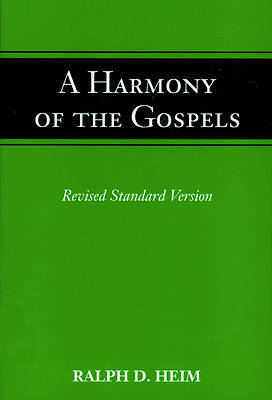 A classic manual that has gone through more than twenty printings, this book is the first Harmony of the Gospels to use the Revised Standard Version of the Bible. This simple and nontechnical book presents the Gospel materials in parallel columns in order that the Bible reader can compare the varied texts. It does not restrict itself simply to the Synoptic Gospels but includes the Fourth Gospel as well, thus enabling an overview of the major New Testament descriptions of the life and ministry of Jesus. Dr. Heim presents the story mainly in terms of the action involved, while at the same time disclosing the substance of the teaching passages as adequately as possible. He exposes the major parallels in several accounts without tearing texts from their contexts and without constantly breaking up passages and transposing verses. He deliberately focuses on the large movements of thought and action, avoiding minutiae of all kinds. Although footnotes and cross references are held to a minimum, an index is provided for easy location of individual passages.